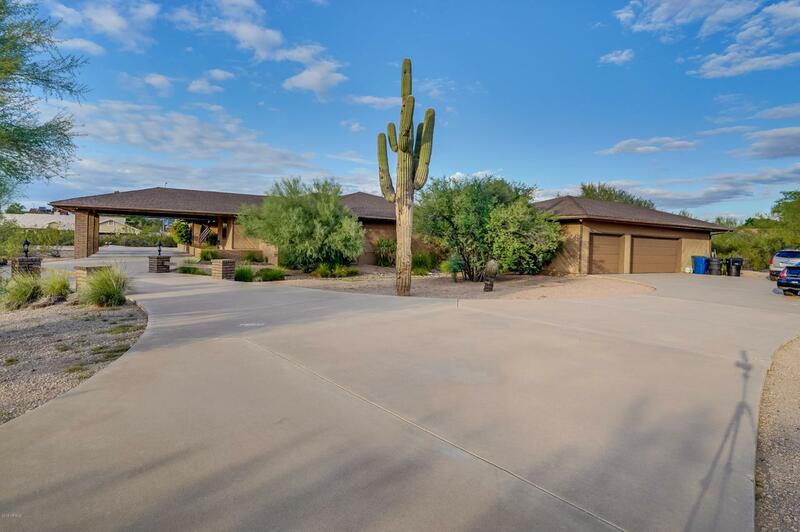 DESERT PARADISE on approx 2.7 acres! This gorgeous block home features a spacious lay out with an Oversized Kitchen, large Island, abundance of storage, eat-in kitchen & beautiful floor to ceiling windows allowing natural light throughout. The Master Suite is to die for, brick fireplace, Upgraded Master Bath includes a true his & her master bath with separate sinks, showers, closets and even a sauna. Amazing large inside laundry room provides an abundance of space- including an office area. Luxurious backyard oasis is complete with a built-in BBQ/bar area, huge pool & ramada. Rare 4 car garage in addition to 2 car carport. No HOA, Build your detach garage/shop/small business in the back with the additional parcel. Upgrades throughout, YOU WILL want to live in this Paradise!